Ang Temba checked in with us on both Sunday and Monday. 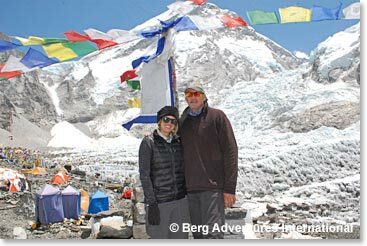 He reported that Mark and Kylie had made the very smart decision to descend all the way from Gorak Shep to Pangboche so that they could spend two nights there with Yangzing before continuing on the Namche Bazaar. 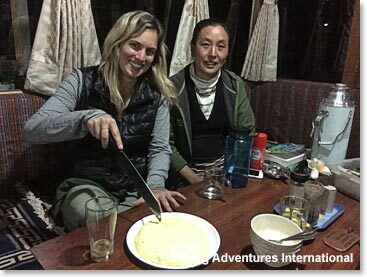 Kylie report before they went to bed on Monday night is below - along with some great photos of Base Camp, Kylie’s horse ride and what life is like at Yangzing and Temba’s Highland Sherpa Resort. Namaste! 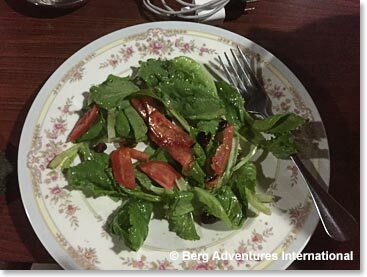 We have started our descent down from Everest Base Camp and are living very comfortably in Pangboche at one of our favorite lodges, Highland Sherpa Lodge. We made it here yesterday and have had a lazy rest day today, which everyone agreed was much needed! We just finished a large dinner spread, the highlight being homemade cheesecake which honestly was better than anything I've ever had in the states. My dad and I keep joking that we will need to join Weight Watchers because the Nepalese will feed you until you can no longer breathe (another sign of their lovely generosity). 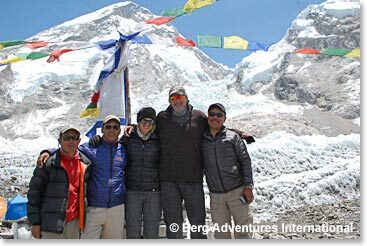 This past Saturday, we made it to Everest Base Camp, the ultimate goal!! 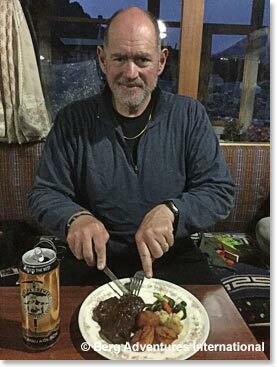 We both felt really strong and had such a unique lunch experience at ~18,000ft. We had the pleasure of sitting with the Icefall Doctors who maintain the route and its necessities for the climbers throughout their expedition (a very dangerous job). They provided some awesome insight into life at Base Camp and beyond. I kept saying it was like a whole different world out there, a little functioning society of people just waiting for the right moment to begin their ascent. Base Camp exceeded everything I thought it would be and the prior 12 days all of a sudden made so much sense. 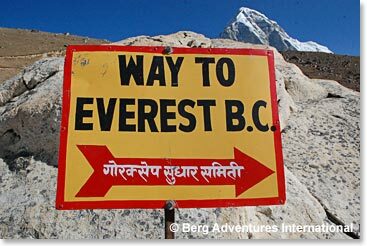 That is not to discredit the journey itself here in Nepal (which we have about 5 more days of) but it really was an experience of a lifetime that has made all the long days that much more worth while. We were both excited to get out of the 17,000ft altitude range in Gorak Shep so we walked a little further than originally planned yesterday to get to Pangboche. 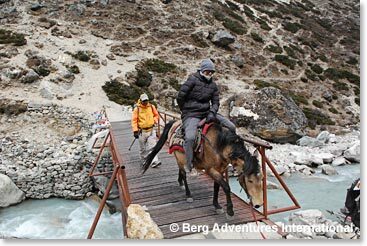 Rather, my dad, Temba and Min walked and I rode a horse for the last 2 hours of our trek. I made the mistake of complaining about my back feeling sore, so I got the horse. 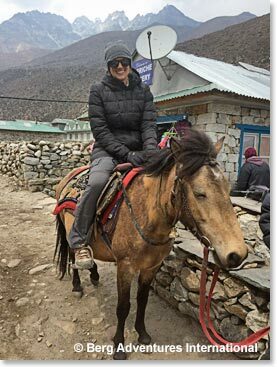 It was pretty funny and while I was crazy nervous going up steep hills next to a cliff on Rama (the horse) it allowed for a completely new perspective of the Himalayas. Normally on the trail, if your eyes go up, your feet need to stop. While on the horse, I did not have to focus on the path and watch my own footing so I was really able to take it all in. 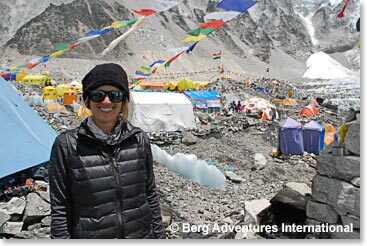 Tomorrow, we are moving onto Namche where we will get to do a little more shopping! Goodnight! 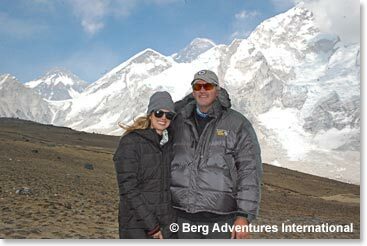 Daughter and Father beneath, The Mother Goddess, Chomolonga, also known as Mount Everest. 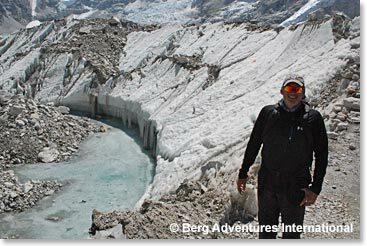 Down the glacier a ways from Base Camp, Mark is standing in at area that shows just how wild this glacier looks. Yes, Kylie rode a horse down! It was an interesting ride at times. 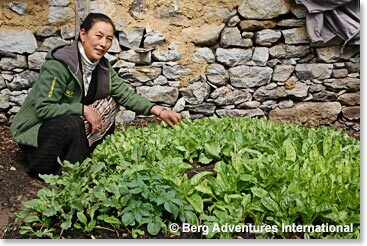 Even though they are at 13,100 feet above sea level, Yangzing and Temba grow many of the vegetables they serve at Highland Sherpa lodge. 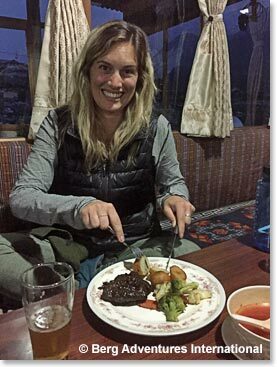 Kylie enjoys Yak Steak, potatoes and fresh vegatables. The homemade cheesecake was excellent!